Danie Thomas, a Dormer stud breeder in Kroonstad in the Free State, is first and foremost a businessman. Always striving for the best, he bought his commercial Dormer flock in 2013, and Johan Havenga’s and Hendrik Steyn’s Kairos Dormer stud in 2014. At the Kairos production sale this year, Danie’s commercial Dormer ewes achieved the highest-ever South African price, with ewes in-lamb selling for an average of R5 600, and open ewes of seven to eight months selling for an average price of R3 500. He ascribes his success to stringent selection for fertility, structural soundness and adherence to breed standards. His operation is run according to strict business principles; anything that is not profitable is eliminated. When Danie was 10 years old, his family settled on the farm, Bankies. Soon after, Danie launched his first business selling and buying pigs in and around Edenville. At the age of 17, he established his farming enterpise with 50 broiler chickens. Shortly thereafter, using the income generated by his broilers and his other, smaller businesses, he bought 36ha of land and 30 lamb weaners. Danie and Riekie Thomas with the Kairos Dormers flock managers. Back (from left): Willem Maribe, Riekie, Danie and Jan Tseko Tjotjela. Front (from left): Raboshene Edward Ramoliki, Machini Meschack Mokoena and Benjamin Ramabitsa. This was the beginning of his career as a sheep farmer. By 2012, he was running a feedlot of 6 000 sheep, and 900 beef weaners on pasture. He marketed the sheep and cattle every two and four months respectively. During this time, he began keeping detailed records of the different breeds and crossbreeds in the feedlot. He was also the first farmer in South Africa to import the Gallagher Sheep Auto Drafter, a fully automated weighing and sorting system from Australia. Danie’s motto, ‘Faith and positivity’, was tested when he lost his feedlot enterprise in 2012. “I ended-up in a court case with a leading commercial bank,” he says. “The matter was eventually settled, but not without leaving scars. One wrong decision by a bank official affected my business to such an extent that I had no choice but to call it a day and start afresh elsewhere. Danie says that while life may be unpredictable, it offers unmissable opportunities. He had six opportunities to buy Havenga’s and Steyn’s Kairos Dormer stud, but could not afford it. Then, in 2014, he was offered the stud for the seventh time, and finally took the opportunity. He admits that he was uncertain, even after he had bought the stud, and even tried returning the stud to its former owners. Fortunately, they refused to buy it back. Danie farms on 1 000ha, which includes the farms Canada, Annex, Morning Star and St Lawrence, as well as the farm where he and Riekie live, Roydale. His Dormer stud consists of 106 ewes, including the 18 ewes he bought from the Rhenosterbosrug stud in August of this year. He also farms a commercial Dormer flock of 1 200 sheep, and a Beefmaster-type herd of 200 cattle. He explains that he selects the best in the flock for breeding to safeguard genetic integrity, but plans to increase the number of stud ewes to 250 over the next year through embryo transplants. As Danie’s primary objective is to optimise mutton production per hectare, the Dormer’s outstanding fertility and maternal ability have made it the ideal breed for him. The ewes generally produce twins or higher multiples, which markedly increases sustainability and profitability. Danie’s stud flock is run on an eight-month breeding system. Dormer lambs are weaned at 60 days, and both stud and commercial lambs achieve an average weaning weight of between 28kg and 32kg. The commercial ewes, however, follow a 12-month lambing season. Commercial in-lamb ewe flocks are penned in March, and lambing usually occurs from late March until mid-April. Danie explains that it is more cost-effective to breed the commercial ewes only once a year, and the stud ewes every eight months. Danie says that the Dormer is a high-value breed, as evidenced by the ever-increasing demand for the breed. The Dormer is known for its high slaughter percentage and early maturation. It is also renowned for its exceptional average daily gain (ADG), which makes it an excellent breed for feedlot enterprises. “The average Dormer ADG in my feedlot was 417g/day. The Kairos flock’s average slaughtering percentage is 50, 2%, and the ewes wean their own weight in 12 months,” he explains. The relatively low Dormer birth weight of 4kg largely eliminates lambing problems. Danie’s stud’s inter-lambing period is fewer than 365 days. The minimum allowable ADG is 400g/day. Danie admits he is concerned about the longevity of Dormer ewes, particularly in an eight-month lambing system. However, he says that their relatively short lifespans are mitigated by the breed’s exceptional fertility and multiple births. All his commercial sheep sold at production auctions are also marketed under the Kairos brand. “It makes more economic sense to market my commercial animals under the Kairos brand, then to just send them to the local abattoir.” Danie’s objective is to supply the best possible genetics to both the stud and commercial sectors. “So I need to establish the Kairos brand as a reliable, sustainable and trustworthy brand. I also use the latest technology, including artificial insemination and, shortly, embryo transfer. I’d rather buy one outstanding ram and multiply his genetics than buy a number of poorly performing rams,” he says. Forage consists mainly of sweetveld. Where necessary, green feed is planted for winter. Telwiedré creep feed is given to lambs from 10 days, while ewes receive Maxiwol from six weeks before lambing, to two months afterwards. When sheep are on pasture, they receive Telwiedré green feed lick, and, when moved to veld or maize stover, they receive Telwiedré ewe lick. The average annual rainfall is 600mm, and the carrying capacity is 1SLU/ha. 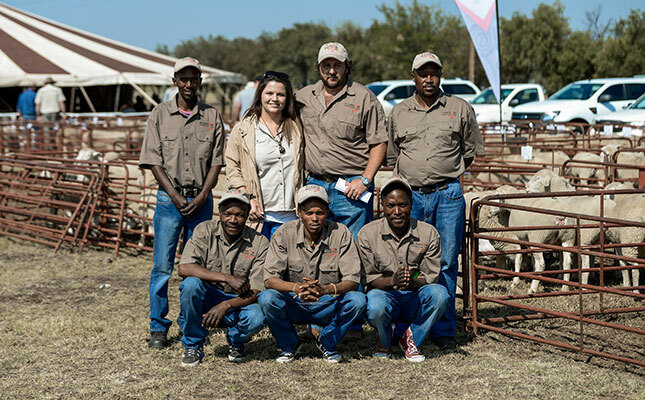 Danie employs five flock managers who are each responsible for the management of a specific flock. The commercial flock is divided into two or three groups, while the stud animals are run together. The flock managers live with their respective sheep flocks. Danie bought each a caravan, which he moves along with the flock in a rotational grazing programme. The land is divided into 20 camps, each with its own watering point. The rotation depends on the condition of the veld and pasture. The sheep are kraaled every night to prevent predation and theft, and every ewe is fitted with a Celmax collar. Contact Danie Thomas on 082 687 3656 or email daniethomas6@gmail.com.